So I took of Thursday with the intention of getting ahead on my homework for the math I’m taking online. I looked at the weather report and realized Saturday was going to be full of rain. So I switched to doing yard work I had planned for Saturday. I took Sarah and Joseph along and we got some supplies and plants for my projects from the Home Depot. I normally prefer Lowes but their saw was not working this past Saturday. The prediction for rain was correct and I will get to that homework in a few minutes here today. First I’d like to do a quick blog post about some of the yard work I did. I mowed and fertilized the backyard but I also did a couple more interesting projects. 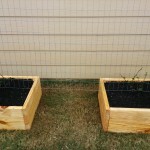 In my first project I built two raised planters and placed the start of some blackberry bushes in them. 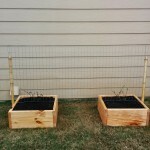 I figure the raised beds will help me keep them from growing into my lawn. I also made a simple trellis from spare fencing and wood that I had. I also think the position of the bushes will provide an additional natural thermal protection layer to my house. The wall the bushes are against get a good 6-10 hours of direct sunlight so I hope they will thrive in their current spot. The wood for the boxes were from some simple 2″x12″x8′ that I had cut down. 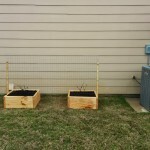 Each box is 2’x2′ and hold roughly 4 cubic feet of soil. The bottom of the boxes are open but I placed cardboard down to assist in killing the grass below the boxes. Prior to placing the boxes I cut the grass down to as close to bare earth as I could get. I also looked it up and realized I should have already removed the stakes from my trees. So I cut out the wire and started trying to wiggle them out. This was of course some tough work. I thought there had to be an easier way so I looked on Google and found a handy guide on YouTube with easy to follow directions on a method that worked for me. In my case I had 1’x6’x4″ boards but they substituted in okay for the place of the 2’x4′ boards. They just got chewed up good by the stakes biting into them. It’s projects like this that make me glad I purchased my large wood vice last year. I first used it for building our table but it has come in handy for several other projects. Below is the video guide I followed for removing the stakes.